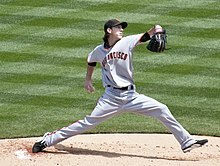 As a Giants fan watching last Sunday’s game between the Baltimore Orioles and the SF Giants, it was something to behold. I mean it was a decent game until the 7th inning and then the Baltimore Orioles remembered why they were there, that they had come to play and were still in the game. In the 9th inning Adam Jones hit a spectacular 3 run homer and it was downhill from there, Orioles winning 10-2. It was just another disappointing game for the Giants and especially for their fans who’ve had to endure late inning come-from-behind wins by their opponents all season. So be it, la dee dah, c’est la vie. That’s baseball. So Monday morning as I’m reading the commentary and box scores and perusing the sports section I come across an article Adam Jones had tweeted about someone throwing a banana at him in the 9th inning. I’m thinking how juvenile and not very sportsman-like it was, but didn’t give it much more thought. Until the next day. A fellow came forward Monday afternoon after reading the banana article and recognized, to his dismay, the article was about him. Evidently as he was leaving the game in the 9th inning, he grabbed a banana off one of the vendor’s carts and hurled it toward the field, thoroughly disgusted by the Giants performance in the day’s game. It was a pretty stupid thing to do, but I could relate. I felt the same way after watching the game on my telly but, there being no bananas on a cart close by, I decided to watch a movie instead. I don’t know about you, but it seems obvious to me the fan was being, well, a fan, which is short for fanatic. He shouldn’t have thrown anything onto the field, bad behavior, bad thing to do. Can’t do it. Whether he threw it “at” someone is debatable and I’d like to take him at his word and assume he did not. It just seems to me that everywhere you look people are trying to turn situations into something they’re not. Is it political correctness? Is it racist? Or is it just plain stupidity? Personally, I’d like to see an apology from Adam Jones for maybe overreacting just a wee little bit. Now that would show some class. How about it Adam? Show a little class. “Melky Who”? Who Needs Him ~ Who Cares. I mean haven’t these guys learned anything? Are they so desperate and stupid that after all the grief baseball players, and for that matter the entire game of baseball, have gone through with PEDS, suspensions and hall of fame concerns, do they think they’re the one lone infallible soul that won’t get caught? Good grief. 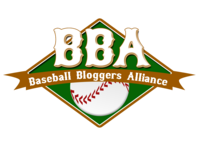 Major League Baseball took much too long to finally take a stand and, now that they have, the rules are written and they need to be followed. The thing that really stuck in my craw was the nonchalance with which basically Melky answered, “I did it” and then didn’t have the guts to face his teammates. Nothing, nada, zilch, not a word. 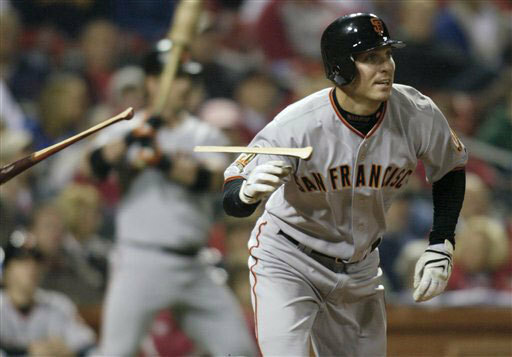 The San Francisco Giants have had this albatross around their neck for a long time beginning with Barry Bonds (though he’s never admitted it) and several in-between dandies ending with Guillermo Moto’s 100 game suspension that ends this week. Is Barry Bonds guilty? Probably. But at this point does it matter? Baseball has to get past this and it starts with the players. It’s called personal responsibility and it’s something that’s sadly lacking in our new- age culture. Don’t like your boss? Sue him. Made a bad investment? Sue your broker. Your doctor didn’t quite fix your hangnail the way you wanted? Sue him. Nobody takes responsibility for anything anymore. It’s always somebody else’s fault. The players are paid huge sums of money to play the game and to play by the rules and it’s their personal responsibility to see that they do. But here’s the crux of the matter, the redeeming feature of the story. The SF Giants are doing just fine without Melky Cabrera, thank you very much. Since his suspension the Giants have won 7 of 10 games and now lead the National League West by 3.5 games. They were tied with the LA Dodgers when Melky left. It’s possible Melky might end up winning the batting crown this year, but you know what? Who cares? Nobody remembers a batting crown champion ten years down the road, but for sure they’ll remember a 50 game suspension. Here’s another Father’s Day post I felt compelled to share. It’s written by Stephen Jordan, Managing Editor of Pastime Post, and was a recent winner in a contest sponsored by Bernadette Pasley, Lady at the Bat. 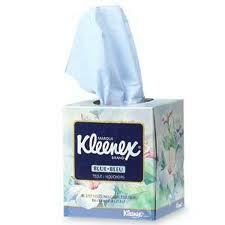 But this one comes with a warning “Grab a Kleenex”! “My father was not around much when I was a child, sadly enough. Over the years, our constant connection though was always through sports. We could always talk long-distance on the phone, always being physically separated by countless states, about baseball and football. It was the sturdy cement foundation of all of our conversations, and it was the glue that held our relationship together, no matter how strained it truly might have been. I will always recall one story more than others: upon reflection it seems to capture a special magic I shared with my two brothers and our father. It was the summer of 2007. It was not a perfect relationship that we all shared with Dad. 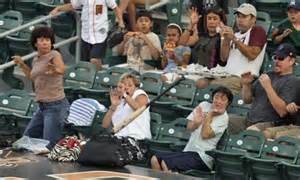 As a kid, personally I had wished Dad could attend some of my baseball games, y’know in Little League and in High School. That never happened. Dad was an alcoholic troubled by his demons. Nonetheless, I do know, however, in my heart and mind how much he loved all of us kids, and the special place he always had in his heart for us kids, and sports. Me and my family would always listen with great interest to my youngest brother Scottie, whenever he would share with us his rare and wild sports predictions (only when the spirit struck him so; he would never predict anything unless he “had that feeling”). His curious, unprovoked predictions historically had always turned out to be spot-on correct. So, when he spoke about his premonitions, we all listened. My Dad started referring to Scottie as “the Guru” during Barry Bonds homerun race to catch Hank Aaron’s mark of 755 homers. (None of us were every Bonds fans for sure, but we were all sports history buffs, and we did fully realize the magnitude of that moment and the importance of that baseball record.) Scottie scratched his head and threw out a prediction that Bonds would hit homerun number 754 on July 27, 2007. He “felt it.” My Dad laughed and expressed his skepticism. Bonds prior homerun, number 753 was hit nine days earlier. On the night of July 27, 2007 though, sure enough, Bonds hit homerun number 754, as was predicted by the Guru. Dad seemed to become more interested in Scottie’s predictions. He demanded that Scottie predict when the next Bonds homerun was going to happen. After a little bit of thought, Scottie informed Dad that Bonds would tie Aaron at 755 on August 4, 2007. When making his predictions, he would never say “I believe that . . .” and then state his prediction. Instead, he would always say, “X will happen, on Y date,” as though it were previously written in the stars, or the bible or something. Sadly, on the morning of August 7th, me and my siblings received a phone call from the complex Dad was living at in Atlanta, Georgia. The kids all learned that Dad had died that morning. He had lived to only 62 years of age. As that painful day slogged along, and the reality of our father’s death slowly settled into our collective minds, me and my family all wondered if that night Bonds would actually hit that 756th homerun. And, as if this were written by some twisted Hollywood scribbler, Bonds indeed hit that record-breaking homerun, on August 7, 2007–the same day my father died, the same day Scottie had predicted the record would be made. We had sports. 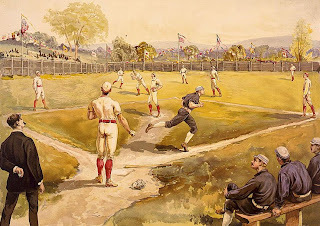 We had baseball. It kept us away from all of life’s unpleasantries. We shared that final moment without Dad with us, but he sure was in our hearts that night and thereafter. We cried when it had happened. I can only hope he watched the feat from his eternal seat within the clouds.